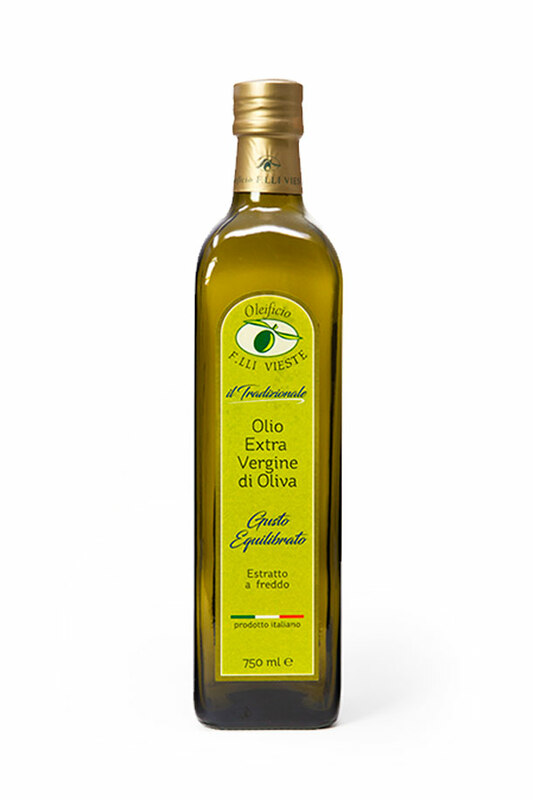 Our Extra Virgin olive oil comes mainly from a selection of the best olives of our fine cultivar “Ogliarola Garganica”. Besides our autoctonous cultivar, we also combined in the production other two excellent varieties of olives Coratina and Leccino, which are selected and processed with the new processing method at 2 phases . The olives are harvested and quickly crused, then pressed with soft pressure that guarantees the homogeneity of the paste and the oil with the lowest acidity. The line Tradizionale is produced using Ogliarola Garganica 100%: the color is yellow tendent to green with sweet and fresh fruity taste typical of the cultivar Ogliarola Garganica. In 1999 we also added to our range the DOP Dauno Gargano, that is exclusively produced by 100% Ogliarola Garganica. Its taste is fresh fruity, sweet, very delicate and balanced at tasting. This oil is always produced by the 2 phases method of extraction. It represents our lands and it contains all the perfume of Gargano land. We also added a blend, by Ogliarola Garganica and Coratina: il Vigoroso. It is produced with the new 2 phases method. 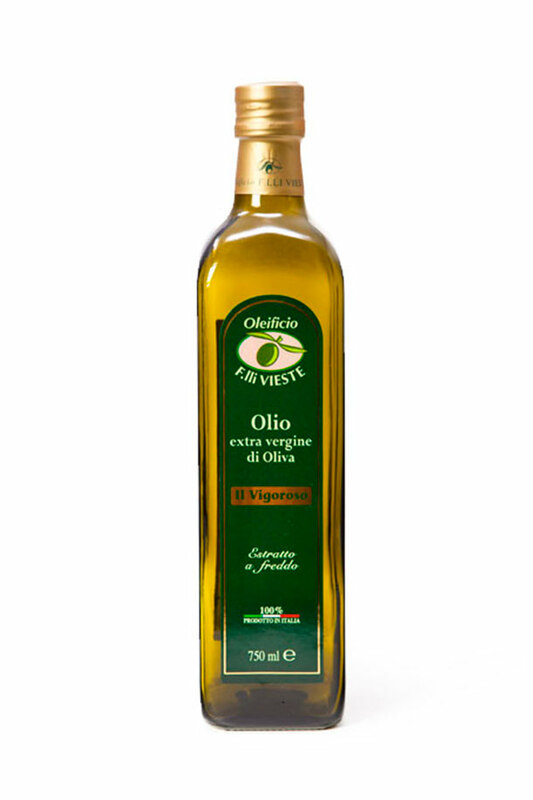 This is the oil with the most intense, decise and persistant taste, typical of Coratina olives, but still balanced by the use of Ogliarola. 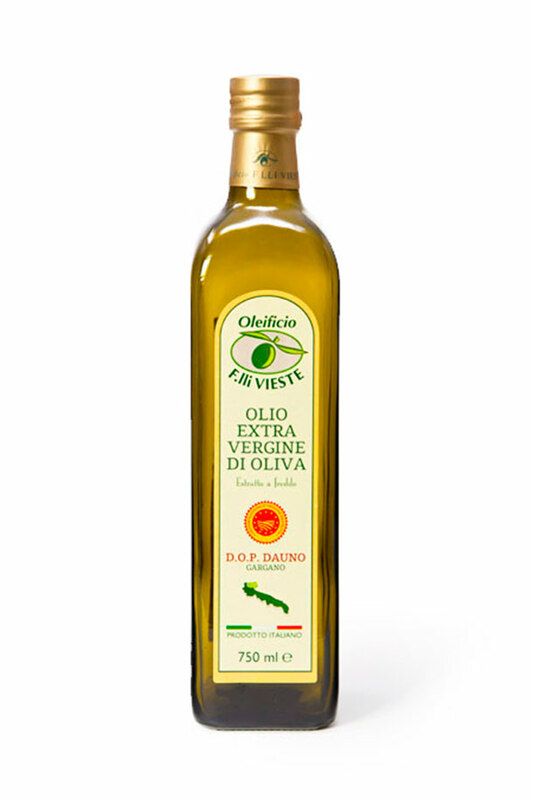 Il Biologico is a line exceptionally produced by organic olives. The cultivars used are Ogliarola Garganica, Coratina and Leccino. The Harvest is unripe in October from fully uncontaminated fields. 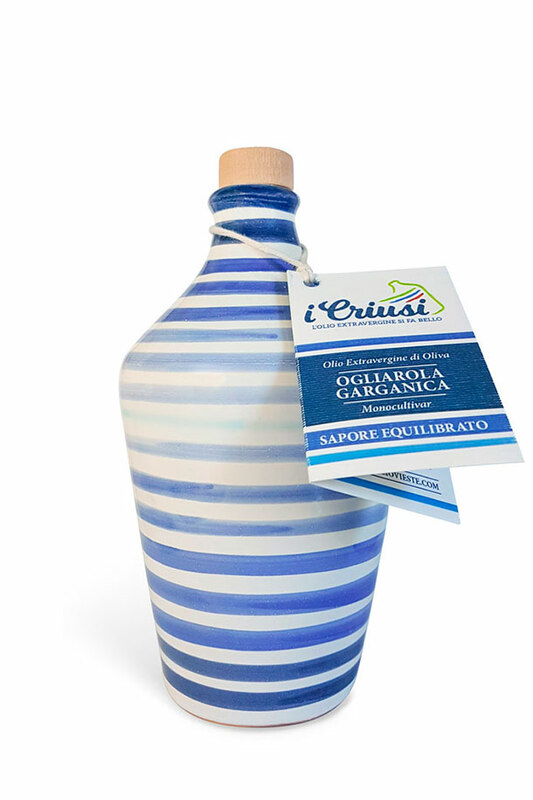 The result is an extra virgin olive oil with strong aroma and uncomparable organoleptic characteristics. Since this year we have had also introduced in the range a new line called i Criusi. This word come from the local dialect, and it refers to something that get curious because of its beauty. 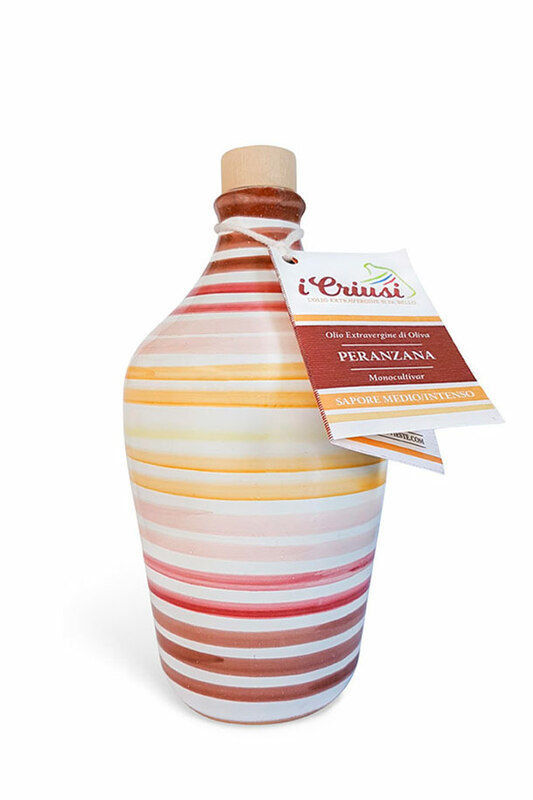 I Criusi, is a collection line of colorful ceramic pots handcrafted in Apulia. This line is available in three variants monovarietals: Coratina, a strong oil at taste, Peranzana, a medium intensity oil, Ogliarola Garganica a balanced oil. Besides the production of extra virgin olive oil, the company also produced some natural cosmetics, since 2008 the company created Linea Olea combining old traditions and new knowledges and also using the exeptional quality of our extra virgin olive oil. The products have been prepared only with the purest essential oils, not containing colorants or essences of petrochemical origin. The Maestrale wind and the perfume of Gargano sea. This is the habitat of Ogliarola Garganica, the variety that mostly represents our land. 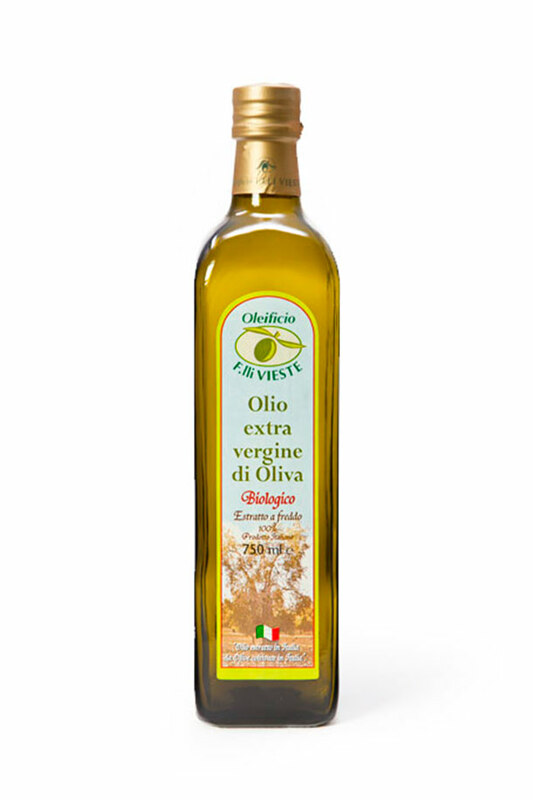 Its smoothness and balance let this extra virgin olive oil be the Queen in every dish. 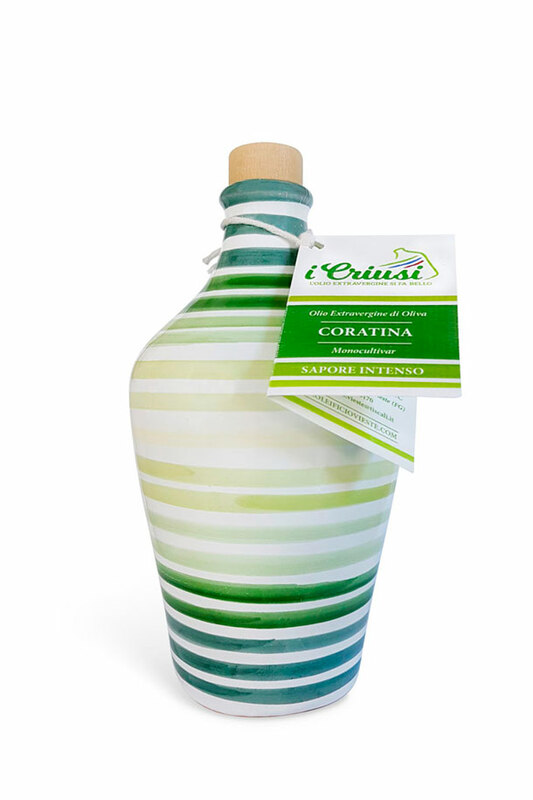 Its DNA consists of 100% Coratina, that is the olive variety with the biggest content of polyphenols. It has a strong and intense character. It’s not for everybody but for strong anche decise people. The cultivar Peranzana is one of the most ancient of our territory. It’s absolutely among the most fine varieties of olives. It’s unique for its perfume that reminds to ripen tomato, arugola and artichoke. It’s the must for the connoisseurs. It is produced using mainly the autoctonous cultivar Ogliarola Garganica. The olives are harvested and quickly pressed with the new method at 2 phases. At palate it is a delicate and well balanced oil. It’s ideal for any use. The monovarietal Ogliarola Garganica is harvested and quickly pressed, it is fruity and sweet because of the use of the most delicate and balanced variety at palate. It represents our land and it contains all the perfumes of Gargano land. It’s an Extra virgin olive oil intense, decise and persistant , but not aggressive. Il Vigoroso is a blend of Ogliarola Garganica and Coratina, that is a combination of the pungent notes of Coratina and the sweet ones of Ogliarola. The color is yellow gold with an intense fruity perfume. Il Biologico is a unique product, that come from uncontaminated fields. The cultivars used are Ogliarola garganica, Coratina and Leccino. The result is an oil with stronger aroma,intense and persistant perfume.